And here we are covering the last remaining heroine route of Rewrite: Akane’s route. This route can only be accessed after finishing Chihaya’s route, and gives much more insight into Akane’s character and the workings of Gaia than we’ve seen thus far. This is the second route written by Romeo Tanaka, who also did Kotori’s route, and the overall feel of this route is very comparable to Kotori’s. It’s very dark, and very draining. Throughout most of the routes, Akane has been portrayed as a central figure in the orchestration of salvation, so this time we’ll be abandoning the ‘heroes’ of Guardian to join the side of the monsters: Gaia. How does the route handle this? Appropriately, I feel. Before I begin, I’d just like it to be known that I plan on mentioning other heroine routes in this post. So, for spoiler-free reading, ensure you’ve read all of the five heroine routes before continuing. I loved Akane’s character in the common route. She had a lot of pride and egotism, and took a lot of joy out of destroying Kotarou whenever he challenged her to an intellectual battle, most often revolving around trying to prove the existence of supernatural phenomena. 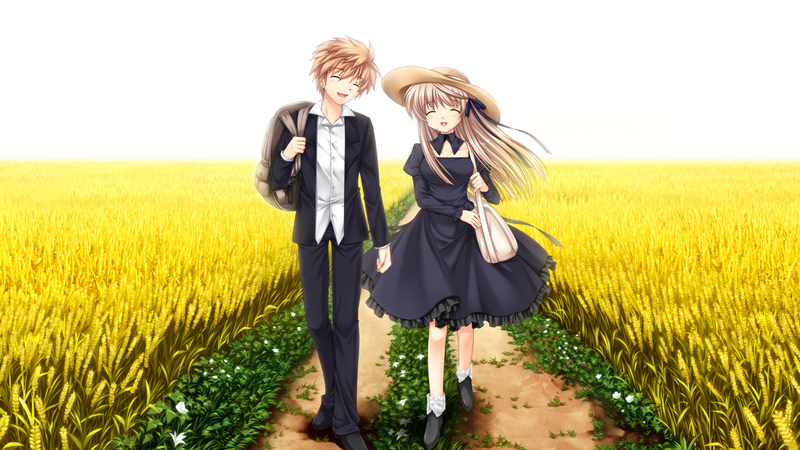 In the end though (at least according to this route…) Kotarou never managed to prove to Akane that supernatural phenomena exist, but the journey was still worthwhile for both of them. Akane’s route begins exactly the same as Kotori’s route, which is interesting because none of the other routes ever did that. Chihaya’s route started similarly but branches when Chihaya decides to return to school, probably because of her new friendships with everyone. 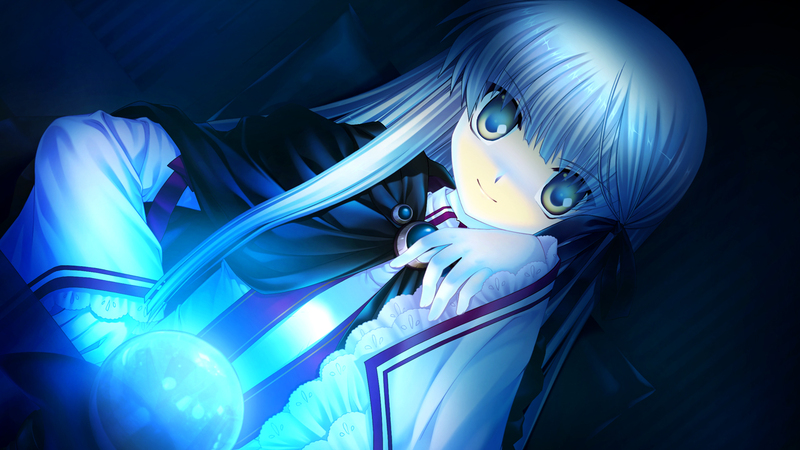 Lucia’s route branched at the point of Kotarou receiving the lead on the Haruka Asahi story. 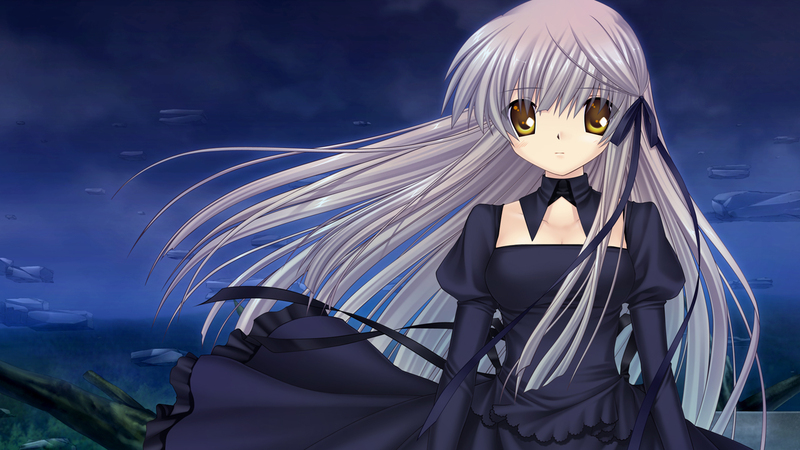 For all we know Shizuru’s route could’ve started out the same, just with Kotarou not returning to school after the incident. I feel like the branching of the routes could’ve been handled a bit better, but looking at it now I guess it wasn’t that bad how they handled it; having multiple writers must complicate matters somewhat. 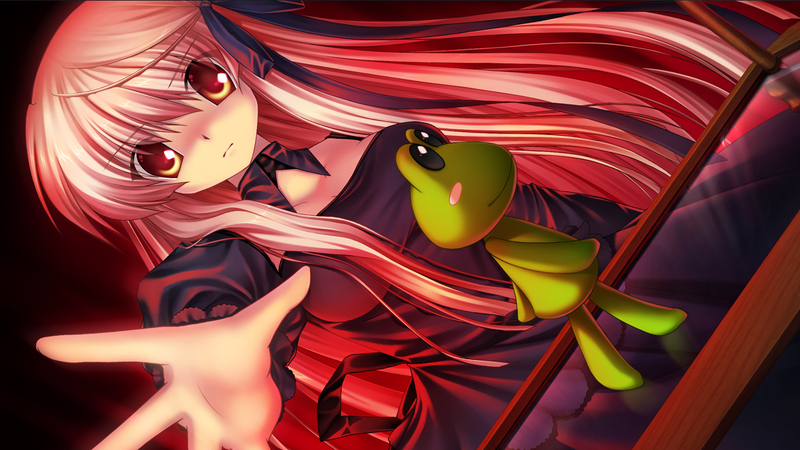 Anyway, back to Akane, it starts off exactly the same as Kotori’s route, word for word. It only branches off at the point where Kotarou visits the occult club room and goes looking at the club members’ houses. He discovers the Enishi house, and finds out Akane was an orphan adopted by Sakura Kashima, leader of the Japanese Martel Group. Having read Chihaya’s route, we should now immediately recognize Martel as the environmental protection group which serves as a cover for the secret organization of Gaia. Kotarou once again states, as in previous routes, that he was once made to attend Martel meetings by his parents when he was a child. Martel presents themselves as a very scientific organization, but Kotarou says that they used to be much more like a religious organisation. While the public face of Martel insists that they are a scientific organisation, the nature of Gaia seems to suggest the opposite. Kotarou, desperate for answers and something to hold onto after everything that had just happened, follows his leads to discover Akane among of a group of women outside of the Martel HQ. He is unable to act, but is relieved to know that he found at least one of his friends. He goes searching Kotori’s house one more time, but encounters a man in a black suit who tries to capture him. Only when he texts Akane asking for help does she bother to respond, and after receiving a message from a leaf bird, Kotarou is invited to the clubroom to finally meet with her. Akane explains the gist of the situation to him without revealing any important secrets, and asks him to return to his normal life, but Kotarou is unable to accept it. He breaks down after Akane states that the occult club is over, unable to accept that it was all for nothing. After realizing the danger Kotarou is in, Akane relents and allows Kotarou to stay with her. Kotarou dreams of a young Akane, a memory from a long time ago that returned to nothing. “It’s identical to death. So I might not be me anymore.” This brings to mind Kotarou’s near-death experience, mentioned in Kotori’s route. Kotarou nearly died saving a girl who had climbed up a tree, and Kotori saved him by using the Key’s power and turning him into a familiar, causing some memory loss. In this dream, Kotarou describes Akane as a mute girl who never communicated with anyone and had no concept of misfortune, and thought that she was going to be happy. Later on he explains that, having met some time in the distant past, Akane had always been in his heart. Apart from Kotori, this can’t be said for any of the other heroines; it really seems to validate their relationship relative to the other heroines. Their past together is never explored further in this route beyond these two dream sequences. How did they know each other? Waking up to hear Akane on the phone, it’s suggested that Akane (and by extension parts of Gaia) know quite a bit about Kotarou’s past, such as his power. Akane then goes on to explain the details of the situation Kotarou is in, and the role he must play in Gaia if he wants to stay with her. Around this point, Kotarou begins to realise that he has fallen in love with Akane, and resolves to do whatever he can to stay with her. We’re soon introduced to Gaia’s HQ, along with many of the people within the organisation. Takasago gets a brief comical introduction, and we’re soon after (re-)introduced to Tsukuno, and introduced to Shimako for the first time. What’s that? A sprited character introduced this late in the game? QUIT CHANGING UP THE RULES REWRITE! Ahem. Tsukuno doesn’t speak, just like the young Akane we were introduced to earlier. Kotarou comments that she feels similar to Akane, and an odd silence fills the room in response, foreshadowing revelations to come. After Tsukuno and Shimako leave the room, we are introduced to Suzaki. A change in the music and narration indicates that the mood has just gotten much more serious, and Suzaki is painted as the enemy from the very beginning. Kotarou is asked to duel Takasago to prove his capability, but in order to defeat him Kotarou is forced to secretly use his power. Takasago despairs, telling Kotarou that that even through hard work and determination, he is unable to best people with natural talent, and leaves the building in shame. The cruelty of natural selection, one of many allusions to Darwinism throughout this route. After the battle, Akane explains that Kotarou may have to resort to killing if he wants to help her, and that if Gaia’s ideals clash with his own, he may leave and betray Gaia at any time. Akane further explains the nature of Gaia and its summoners. Referring back to the questionnaire Kotarou got back in common (the one which determines which route you enter), we’re again presented with the question: if you are dissatisfied with the world, would you want to change the world or change yourself? The dark feelings of a person who can’t accept the world and wish to fight it gives birth to familiars; that’s why summoners often have very strong, dark emotions. Other people who choose to work hard and improve themselves to overcome a problem become superhumans, many of which are extroverted and confident. Kotarou spends time getting used to Gaia, and eventually encounters the Key in the middle of a crowd of people. After informing Akane, he is tasked with her capture. Shortly after receiving the assignment, Akane teaches Kotarou how to use familiars. Watching Akane move the doll without touching it brings to mind Yukito from Air, aha. Kotarou displays some talent for using familiars, something that hasn’t been displayed in any other route. It’s definitely strange to see a superhuman / pseudo-familiar using familiars himself – it seems Kotarou is living up to his ‘A-Type’ classification. The hunt for the Key continues, and Akane gets more and more busy taking care of Sakura Kashima. Kotarou begins noticing just how nihilistic Gaia’s members are, especially the disciples. My interpretation of it is that Gaia exists because it’s members have no will to live. To them their lives are worthless and full of suffering, and so saving the planet gives them worth and purpose, even if it means killing everyone in the world. I’m reminded of Lucia’s desperate pursuit of purpose in her route. Finding purpose in life seems to be a common theme in Rewrite, and very much so in this route. After a while, Akane reveals that she discovered some news about Kotori and Chihaya’s whereabouts. It’s a bit unusual that they haven’t even mentioned that Chihaya belongs to Gaia, but that could probably be put down to a lack of cohesion between the writers. It could also be an intentional move by Romeo Tanaka to keep the other heroines from impacting how we view this one. Kotarou stands by his decision in choosing Akane, but he is still really upset to think about how much he lost that night. After some time, Kotarou finally manages to track down the Key and follows her into the forest. Akane’s scout bird arrives on scene to deliver a poison to Kotarou. Based on the description it seems to be the same poison used by Shizuru to deal with Sakuya back in Chihaya’s route. After a brief battle, Kotarou manages to secure the Key, but things take a turn for the worse as Suzaki’s men figure out what’s going on and close in. In order to have a chance of success, Kotarou is forced to Rewrite himself. The wording used here is very peculiar. Kotarou speaks about sinking into the unknown – a wealth of information about life and a tree of possibilities. He thinks about how all life fights against entropy, and that he must acquire hatred and bloodlust so that he can “fight back against this cold world”. The desire of his heart really does seem to represent some kind of amalgamation of the values of both summoners and superhumans. After he finishes rewriting, he acquires improved strength and superior reflexes, as well as much more control over his aurora. It’s interesting to me how Kotarou’s rewriting seems to be empowered and directed by his emotions; without the resolve to acquire bloodlust he may not have survived the coming battle. After defeating some hounds, the situation gets even worse as Guardian appears and begins hunting him down. He is defeated, and confronted by Imamiya. Kotarou notes how Imamiya felt familiar to him, why would this be? They look kinda similar, could they be related? Just as Kotarou is about to be killed by Imamiya, he prays for life, and something saves him, cutting off Imamiya’s arm and forcing Imamiya to retreat. Kotarou suspects it was the Key’s ribbons, but I think it could’ve been his aurora. Later, Kotarou encounters a wounded Takasago in the forest, and is forced to kill him. It’s the first time Kotarou had ever killed another person in cold blood, from any of the heroine routes. It’s quite a contrast to Chihaya’s route, where Kotarou did everything he could to avoid crossing that line. But here, he was determined to do anything he could to support her; even if it meant becoming a murderer. “My heart is cold. From now on, I won’t just be someone who needs protection. I won’t have the right to complain no matter what happens to me. That’s the consequence of crossing this line.” In Shizuru’s route, Imamiya warned Kotarou not to become a warrior, and it feels like we’re about to see the consequences of becoming one. Kotarou’s momentum continues to dwindle, and he is once again confronted by the superhumans. 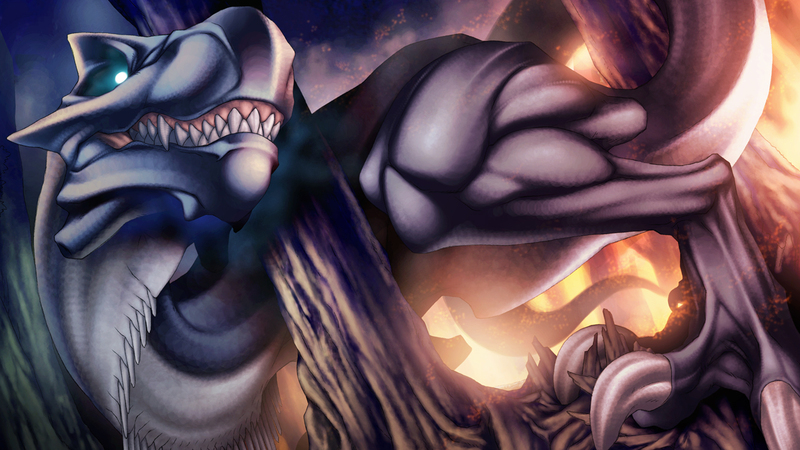 Seemingly on the verge of defeat once more, his aurora aggressively changes shape as though it has a mind of it’s own. Kotarou identifies it as a familiar. 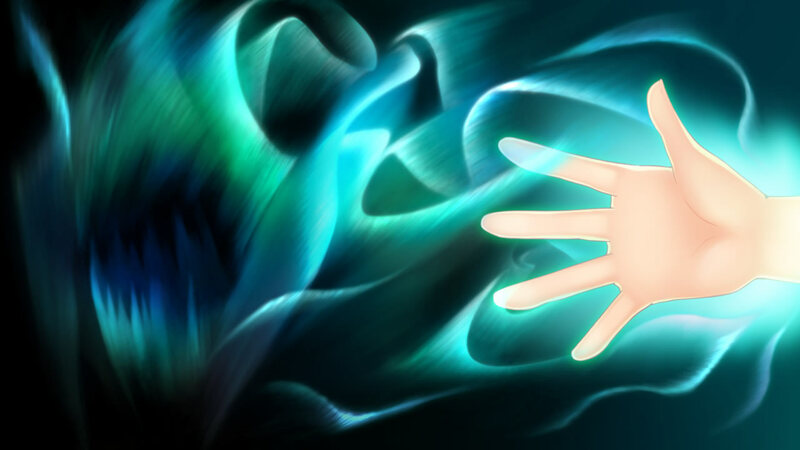 The aurora claws into the superhuman’s flesh like a hungry beast free from Kotarou’s control. It’s a brutal scene, and it even frightens Kotarou himself. In order to stand by Akane on the side of the monsters, he was forced to become a monster himself. It really does feel like the fusion of a superhuman and summoner’s power. Soon Kotarou finds Shimako and Akane’s bird, and notices that tears are streaming down his face, absent of any accompanying compulsion to sob. Wiping away the tears, he notices the blood he’d smeared across his face and hand. This isn’t the time for a emotions, Kotarou knows that, but it seems like his body can’t help but lament over all he’s had to sacrifice to get this far; even if his heart is locked away. The skirmish continues with Kotarou and Shimako escaping on a hound, while Shimako controls a pack of hounds protecting them from the approaching superhumans. The hounds are picked off one after another until all are eliminated and Kotarou is left to carry the unconscious Shimako with him. Thinking of the strain the familiars must’ve placed on Shimako, Kotarou considers his own power. Kotarou’s Aurora is the only reason he was able to survive, and it wasn’t something he worked for or deserved. He understood that accepting the unfairness of his power was the only way to survive, and so Rewrites himself once more, empowering his Aurora. “…now they have brutality and ferocity. And those traits make them dependable.” Another allusion to natural selection, Kotarou is forced to further dispose of his humanity in order to survive. His aurora destroys the arrows being fired at him while he makes his escape, but he is soon surrounded. Just as the situation seems grim, the forest explodes and Akane emerges together with the T-rex you may remember from some of the other routes. “Dynamosaurus. The Earth Dragon.” Akane names it. “The greatest familiar in existence.” It seems like between Sakuya and the Earth Dragon, Rewrite has a hard time deciding which is truly the greatest familiar. This time, the Earth Dragon serves as our ally, and deals heaps of damage to Guardian’s forces. Kotarou goes to find the Key is beginning to wake up. Just then, they are attacked by a superhuman who was quickly dealt with by the Earth Dragon, but not before he was able to shoot an arrow into the Key’s chest. The Key wilts like a dying plant, and Kotarou and Akane lament their loss. Later that night, Akane retires to her room with Kotarou. She questions how she’s supposed to save her disciples now that the promise of salvation has been destroyed. Without being able to save the planet, their lives have lost all meaning. Kotarou admits that he doesn’t know much about salvation, but that there’s something he wants and can only get by staying with Akane. He promises to help share her burden. Holding back her tears, she gives Kotarou his new job: to prevent her from having to cry again. As Kotarou’s pursuit of happiness with Akane is just beginning, they are informed of Sakura Kashima’s death. The next day Akane reveals her simultaneous hatred and love of Sakura Kashima to Kotarou. “…Sakura Kashima granted me intelligence. And then I immediately hated her. At the same time, I loved her.” “That’s part of being the holy woman… or her heir. All humans love themselves, but at the same time find themselves intolerable.” Kotarou is confused by what she means, but she continues confiding in Kotarou. After consoling her, Akane breaks down and sobs into Kotarou’s chest. This may be the first time she’d shown Kotarou (or perhaps anyone) her vulnerable side. 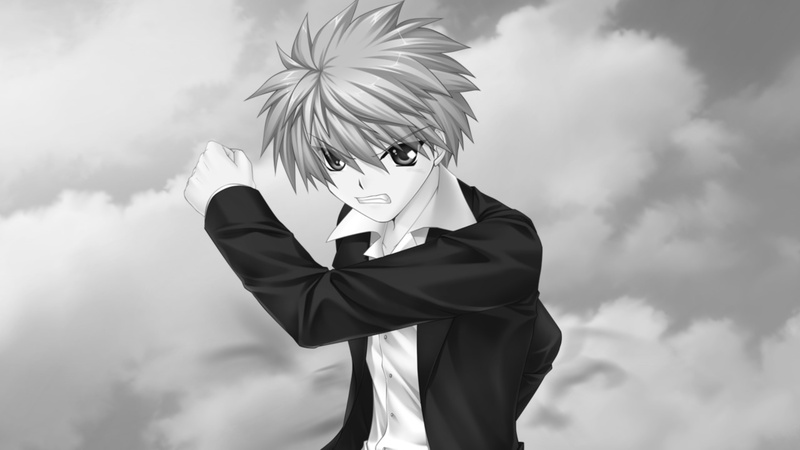 Tsukuno shows up later that night and reveals that Sakura Kashima was murdered. She also whispers something Kotarou can’t hear that causes Akane’s expression to change. Akane quickly leaves without telling Kotarou anything, and he wonders what could’ve caused such a reaction from her. I think it’s clear that this is the point where Akane discovers that the Key is still alive, and so from this point deviates from the path Kotarou had hoped to walk with her. The following morning after the funeral, Kotarou notices that Akane was acting strange ever since the previous night. “The covenant between me and Sakura Kashima was fulfilled upon her death.” she tells Suzaki, intimidating him with some kind of confidence. With Suzaki unable to figure out what she was planning, Akane left the room triumphant. Beyond Kotarou’s awareness and control, everything he had been fighting for was silently falling apart. A year passes as Kotarou continues to serve as Akane’s bodyguard, watching her fulfil her responsibilities as the holy woman like a completely different person. Oblivious to everything, Kotarou was satisfied to live in service of Akane, despite a growing emotional disconnection between them. Akane went around to hospitals healing people with physical and mental ailments with the power of the holy woman, many of which subsequently joined Gaia as disciples. On one of his free days, Kotarou spends his time wandering Kazamatsuri, thinking about how much he had changed from his carefree days as a student. He encounters Yoshino, and thinks about how the two of them failed to form any kind of relationship when they had the chance. Kotarou turns his back to him as Yoshino begins speaking, trying to question him about Kotori’s absence. He suspected Kotori and the others were involved in the war somehow, but he took some kind of comfort in the fact that he never came to know who belonged on which side. 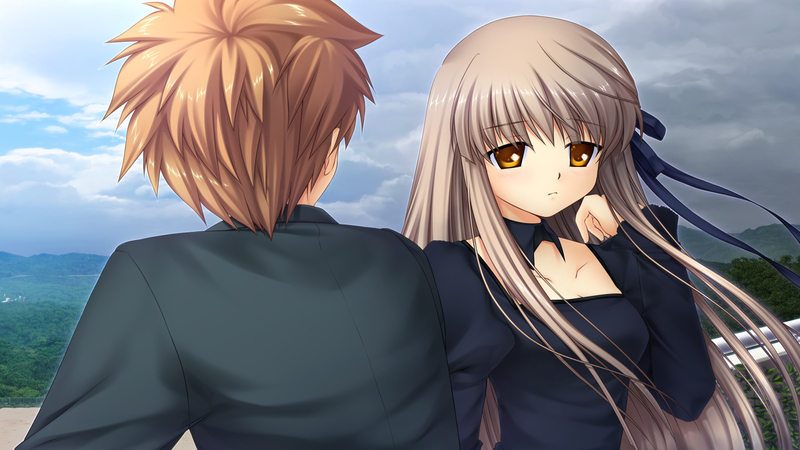 Nishikujou asks Kotarou if he remembers her, and soon after their conversation begins she starts challenging his views about humanity and the earth. After hearing Kotarou speak of the values of Gaia, she relents, seemingly disappointed with his response. Before disappearing, she tells Kotarou that Akane is going to destroy the world. Akane begins teaching the disciples to sing a hymn which she describes as “The planet’s song.”, which symbolises impending natural disaster. The evidence of Akane’s intentions keep growing in number, but Kotarou doesn’t want to acknowledge it. Soon much of Gaia’s activities become known to the public, of particular note the recruitment of disciples. Akane and Kotarou’s identities are made public, and they’re forced to shy away from the public eye along with the disciples. Gaia gradually splits in two as Suzaki’s faction leaves for a new HQ outside city limits, leaving the disciples and the few remaining Gaians to fend for themselves against the onslaught of public scrutiny. Akane spends her days conducting the rehearsals for the hymn and eating snacks, acting unnaturally carefree given the situation. She must be feeling relief from the knowledge that she is working for a greater purpose, and that the end is approaching. Akane once again casually suggests that Kotarou leave Gaia, but Kotarou can’t stand the thought. Kotarou tells Akane that he won’t let his disapproval of Gaia’s values get in the way of his love for her. While wandering through Gaia HQ one night, Kotarou notices some kind of strange presence above, and a voice identical to Akane’s begins speaking within his mind. The voice tells him of the inevitable destruction of the world, and the pain of living. Kotarou is forced to confront the differences between his and Gaia’s views. Between the Planet and Humanity, Kotarou feels he must choose Humanity, even if he hates Guardian. Kotarou wishes he could’ve been born a few years earlier so that he might have been able to do something to change the world. The voice asks Kotarou to take her with him when the time comes. To choose “…me, not Akane…”, because she had decided that all she wants is to be with Kotarou. “…choose me… …and find happiness… …that’s the final…forbidden fruit…we can give to humanity… …it’s the last one…” Okay, so this one has me pretty stumped. I’ve been racking my brain over it for a while, asked a bunch of other people for their input, and I can’t reach a solid conclusion. This feels like one of those scenes meant to throw us into confusion, ugh. But, I’ll give it a shot anyway. If I had to determine who the person speaking is, it’d have to be some manifestation of Akane. There seems to be this growing duplicity between the old Akane and the Holy Woman. Maybe it’s even more complicated than that… But anyway. All the nihilistic talk about how life is suffering really seems to mirror Gaia’s teachings, like something Sakura or the ‘Holy Woman’ might say. But then she’s talking about how Akane is possessed by the holy woman, and how she just wants to be with Kotarou. Almost like some kind of amalgamation of the two personas, going back and forth. I think this is Akane’s deepest wishes speaking at the end there: to stop worrying about the fate of the Earth and just be with Kotarou. So, what can we take from all this? Akane is suffering with the burden of life, but wants Kotarou to save her from the hell she’s constructed. That’s my interpretation. Following that strange phenomenon, Kotarou has a talk with Akane, carefully dancing around the topic of salvation and questioning Akane’s willingness to live. Akane denies that she’s given up and insists that she trusts and loves Kotarou, but this rubs me the wrong way. Perhaps she’s just trying to deceive herself as much as she is Kotarou… They move to the school rooftop to continue their conversation, where Akane finally reveals the true nature of the ‘Holy Woman’. The Holy Woman has the power to heal people, but is always oppressed because of it. When the Holy Woman dies, her power is transferred to another person close to her, and that person inherits some of the memories and emotions of the former Holy Women, a process they call transcription. The subject of transcription must first lack a sense of self to be able to gain the self of the Holy Woman. By transforming those dead brain cells into a familiar, the Holy Woman is able to be passed on. Akane asks Kotarou if she changed at all when Sakura Kashima died, but Kotarou lies to both himself and her and tells her no. Despite the overwhelming hopelessness he feels from receiving this information, he resolves more than ever to stand by Akane to keep her safe from herself. Suzaki once loved Sakura, but after she inherited the Holy Woman, he was unable to accept the person she had become. The fact that Suzaki was in the exact same situation he is in now bothers him, but at the same time he remains determined to not let himself succumb to the same fate. The next day, as if to add insult to injury, Akane and all the disciples disappear. Wondering why she didn’t take him with her, Kotarou is left to lead the remaining Martel employees still at the HQ. When he returns to Akane’s room, he discovers a message she left for him in her notebook. The message explains away her desire to stay with him as weakness, and apologises. She says she is leaving Kotarou to keep herself from hurting him any more, and to enact out salvation. “I’m a broken woman, incapable of accepting other people. So please don’t forgive me. Goodbye.” Before Kotarou is even able to process all the emotions he’s experiencing after reading the letter, he is contacted by Suzaki who asks for Kotarou’s help. Suzaki tells Kotarou that ten years ago his men had captured the Key, but it managed to escape. This was never mentioned in any of the other routes – seems like an important detail. Suzaki tells Kotarou about how he planned to turn familiars into a global industry and help extend the life of the planet. For the first time Kotarou begins to empathise with Suzaki. Suzaki tells Kotarou that Akane has the Key’s corpse, and plans to enact salvation with it. Kotarou decides to assist Suzaki in preparing to evacuate the people into the city of stone to protect them from the impending destruction. A short time later, a news helicopter is destroyed by the disciples’ leaf dragon near Gaia HQ – my guess is to prevent people from locating them. This only ignites the public’s suspicion of Gaia and the police prepare to raid the HQ. An Earthquake shakes the city, and more and more people begin hearing the hymn. Natural disasters break out all across the Earth, signalling the beginning of the end. In response to this, the remaining Gaia employees mobilise to begin the evacuation. Before they can get anyone out, they discover that the ‘observer’ familiar managing the connection to the shelter has been damaged by the earthquakes. With Kotarou at a loss of what to do, Shimako appears as if on cue and repairs the observer. Just as things are looking up again, Guardian’s superhumans appear and Kotarou is forced to Rewrite his senses to deal with them. He describes it as if being able to perceive the chemical make-up of the air around him as a mass of slowly changing numbers. He suspects that if he went any further, he might end up completely outside the human world. After a brief battle, Kotarou encounters Takasago again, much to his surprise. Takasago tries to trick Kotarou into leaving him with the observer, but Kotarou sees right through him and Takasago reacts with a tremendously powerful punch unlike any he was capable of in the past. Oh hey, Kotarou’s sprite shows up again for some reason. Why this late in the game..? No really, why? I’m more than a little confused about that. Anyway… Takasago escapes unharmed and Kotarou is contacted by Suzaki who insists that he and his men will remain on the surface for salvation. Kotarou thinks about how strange it is that so many people want to die with the world. Kotarou even considers doing so himself, but before he can think about that he has to meet with Akane, which he suspects won’t be until the final moments. Kotarou hands Shimako over to the shelter despite her screams of protest and hurries back to the surface. Kotarou surfaces to a scene of unparalleled destruction. Kazamatsuri is quickly being swallowed up by the forest which has always surrounded it. The salvation in this route seems very different to how it was portrayed in Shizuru’s route, which was comparatively very instantaneous. One might suppose that it’s only gradual destruction here because the Key isn’t completely alive, or you could again put it down to a lack of cohesion between writers. Seeing all the destruction causes Kotarou to begin seriously questioning why he’s been following Akane. He knows he thought hard when he made his choice, but he can’t help but feel like he made a mistake somewhere. “I love Akane. But I hate the sins she’s comitted.” The evacuation begins, but violence breaks out everywhere among the civilians and an unknown enemy begins destroying the escape routes, slaughtering many people in the process. Kotarou sees the brutality first-hand and feels disgusted and outraged that somebody could commit such evil. Just as he thinks that, he realises how his and Akane’s sins are indistinguishable from those of the perpetrator of this terror, and swallows his anger. As the escape routes continue to be destroyed and Kotarou is at a loss of what to do, an image of one of the exits synchronises with his vision for a brief moment, and he rushes to it without questioning where the vision came from. When he arrives, he discovers that the vision came from a golden leaf bird. Kotarou isn’t sure who it belongs to, but he says that looking at the bird makes his chest feel tight, and he apologises to the bird without realising why. We’re never offered any more explanation, but by that description and the fact that he’s connected to it, I think we can assume that the owner is Kotori. This is the only presence she has in this route; I can’t help but feel a little bit sad for her. Also, apart from this scene, none of the other heroines are seen again in this route. We’re left to wonder how many make it through salvation alive. In this regard, the route is very disconnected from the others, but I’m not exactly against that. I’m glad they kept the focus on Akane here, since Kotarou is so devoted to her. Just as the evacuation recommences at this exit, familiars appear and start attacking people. The mass of people run around in panic, getting more and more crazed and frantic as Kotarou keeps fighting. The sound effects are muted and the background becomes inverted as Kotarou continues fighting, his heart breaking apart from the futility of his efforts, continuing to move only for the possibility that he might see Akane again. Kotarou continues running through the city helping anybody is able to, and abandoning those who he cannot. He uses his aurora to help someone for the first time, pulling two people out of a collapsed building, one of whom happens to be Yoshino. They share a strange reunion, where Yoshino calls him a hero and says he seems to be living much more honestly than he did in the past. Noticing more panicked civilians, Kotarou is forced to leave Yoshino and confront the monster. Turns out it’s Takasago, and he’s being being powered by some kind of poison. After his defeat at Kotarou’s hands in the forest, he turned himself into a familiar piece by piece as his body was dying, converting poisons into energy to power his transformation. Now he continues to inject ampoules of poisons into his body to survive and become stronger – he is even able to use the poison in his body as a weapon. Come to think of it, this route is incredibly gory; it doesn’t hold back on it’s graphic descriptions. Brutal is one word I’d use to describe many aspects of this route. Takasago is beyond any redemption, mindlessly killing and causing chaos in the city simply because it feels good. You could say that his mind became as poisoned as his body. Takasago moves the battle to another part of the city, killing everybody in sight to provoke Kotarou. 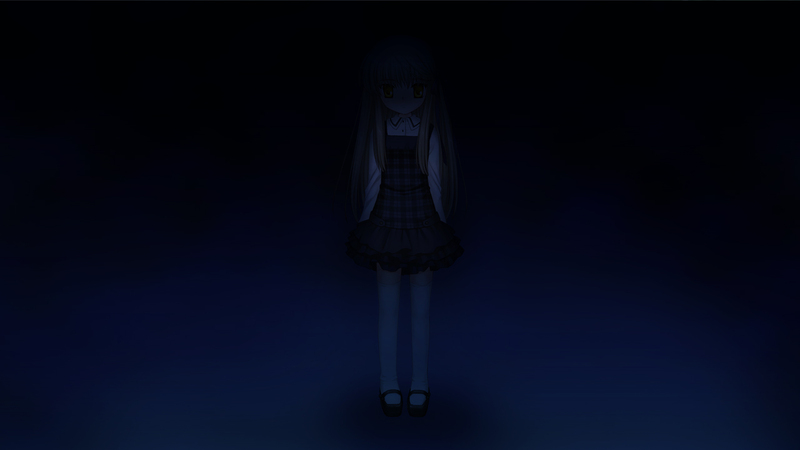 Soon they encounter Kotarou’s old teacher, someone I haven’t seen make an appearance since Kotori’s route. Displaying an act of selfless courage, she tries to reason with Takasago, who responds by slowly crushing her skull. After some more casualties, Kotarou is finally able to figure out how to defeat him, and takes the offensive by attacking with every blunt object he can find and tearing up his insides by inserting his blades into his poison glands. Before long the battle goes beyond strategy and Kotarou finds himself continuously pounding into Takasago’s head with all the strength he has. Yoshino appears and throws Kotarou some brass knuckles, which Kotarou uses to continue to pummel Takasago’s face into the ground. Takasago throws Kotarou off, and Kotarou is too wounded to stop him as Takasago approaches his teacher again. She refuses to leave Kotarou behind, but before Takasago is able to reach her, his body convulses and his flesh turns to dust. All the people around gather and praise Kotarou for his efforts, along with Yoshino and his teacher. Kotarou breaks into tears, unable to accept their kindness after all the time he spent supporting the orchestrator of this tragedy. This is what it means to support the side of the monsters; life becomes an unending journey of suffering where even to be in the presence of kindness is painful. The public becomes aware of Kotarou’s deeds, but his identity remains unknown for the time being. The evacuation proceeds with the aid of the police force as over a billion people die worldwide. After a few days Kotarou notices three guardian helicopters converge on Martel HQ, only to be eliminated by airborne familiars before they can reach their destination. Looking up, he notices they were heading in the direction of an unusual-looking cloud looming directly over the HQ. He assumes that Akane must be up there, but he quickly realises he has no way of reaching it. Two days later the evacuation ends, and Kotarou retreats to the shelter with his fellow Martel employees. The shelter looks just like a copy of the real city now, only with a slightly weaker colour. The city is built to support five hundred thousand residents, leaving enough room for all the refugees and even some future growth. Kotarou notes how the ethics of medical treatment are changing in the new world, and that those who can’t survive aren’t being forced to live any longed than they should. 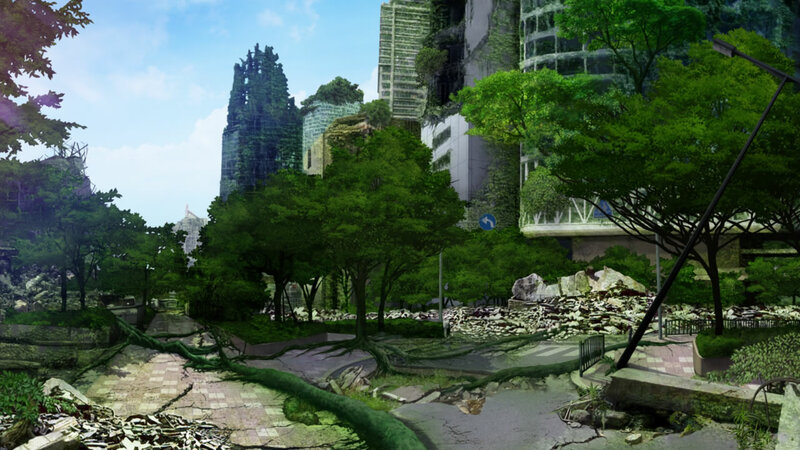 The environment is being sustained through summoning instead of conventional technology, supposedly taking the lives of tens of thousands of summoners to develop it this far. Wandering the city Kotarou finds himself at Gaia HQ where he realises that the other half of the observer familiar is here, but it’s huge, reaching up into the sky. He quickly realises that this is how Akane escaped, and breaks into the HQ and ascends up through the tree as quickly as he can. He reaches the structure atop the HQ in the real world and finds Akane and the disciples singing the hymn. What follows is one of the most interesting exchanges in the game. Kotarou and Akane are both full of mixed emotions after finally meeting each other, Kotarou both angry at what she’s done and in love with her, wanting to bring her home. Akane tells him to leave, that he has no use for her and their mission is almost complete, to which Kotarou responds “…have you been waiting for me to stop you?”. Kotarou suggests that Akane never cared about the fate of the planet. Akane responds saying that she believes salvation can save the world, but Kotarou argues that that has no relevance to humans. Akane says that salvation is a wish shared by everyone who has the capacity to become a summoner, wanting to change the world. But Koratou comments that Akane was never a good summoner, so there’s no way she could’ve hated the world that much. Akane tries to justify her emotions, but Kotarou says that they both know that her feelings were forced upon her by the spirit of the holy woman. Akane is unable to respond, and Kotarou reflects on how she’s been holding back her emotions for so long. Akane confesses that she just wanted Kotarou to live in peace so that she could have disappeared happily. Kotarou insists that, rather than kill her, he must destroy the Key as payback for Akane abandoning him. In response to Kotarou’s threat, Akane and the disciples summon the Earth Dragon and a battle begins – not over the fate of the planet, but over their relationship. Kotarou rewrites himself every second to continue surviving, improving his blades more and more. He likens the improvement of his blades to the technological advancement of mankind, but quickly realizes that humanity’s power cannot match a dragon that existed in ancient times. So, he decides to rely on the power of natural selection to defeat the Earth Dragon, by creating a thousand different blades and creating another new thousand based on the small number which successfully cause damage, over and over again until he can evolve his blades enough to defeat the monster. At the end of his journey through simulated evolution, his aurora resembles the Key’s ribbons. As he fights the Earth Dragon with his aurora cloth, he demands Akane to atone for her sins. He thinks to himself that human morals may not matter any more, but she needs to atone in order to live among other humans. Kotarou successfully destroyed the Key and just as he’s about to be devoured by the Earth Dragon, it drops dead as all of the disciples’ life had run dry. Unsatisfied with his victory, he sheds tears as Akane begs him to leave her alone. Kotarou decides that in order to atone, Akane must do that which she desires the least: to continue living among other humans. Kotarou is aware that she may continue atoning for the rest of her life, being called a sinner by everyone, but he vows to stay by her side if it means she might just be saved. Akane threatens to bite her tongue to escape, but Kotarou kisses her, daring her to do it, and she goes limp in his arms. How grim… This route doesn’t take the destruction of humanity lightly, but the focus never strays from the suffering of our two main characters. Akane and Kotarou are forced to live the remainder of their lives in the shelter, carrying their unforgivable sin with them. As the weeks pass, what remains of humanity inside the shelter begins gradually developing a new society and acclimatising to their new way of life. The game goes into tremendous depth about the changes which society undergo to accommodate living inside the shelter after salvation. It’s really well thought out and feels very real. Everybody slowly comes to accept the loss of their old world and works together to make the ensure the new world has a sustainable future. Heated debates on topic like the death penalty continue throughout the early weeks of the new world. Kotarou thinks that intelligence should be able to solve all these problems, but it often doesn’t help at all. He concludes that it’s simply “..because we’re human”. Akane spends her days sitting in her chair silently, sometimes letting tears flow down her face. Kotarou finds work in the fields and meets Yoshino there, developing their relationship more than they ever had the chance to in the other routes. Kotarou thinks back to how life as a student used to revolve around keeping the mood bright and enjoyable without getting too serious, but now everyone is back to being more honest with themselves and their feelings. It’s really great to see Yoshino and Kotarou finally dropping all pretence and connecting with each other – a fitting end to Yoshino’s story in the absence of any Yoshino route. Akane’s body continues getting weaker and weaker as she eats and sleeps less, mentally exhausted from the cross she’s been forced to carry, and terrified of the prospect of confessing to her sins. With Kotarou having lost his powers after spending so much of his life force defeating the Earth Dragon, they really do exude the aura of an old couple approaching death. The police force soon contacts Kotarou revealing that they know what he and Akane did. They both realise that if this knowledge goes public, most people will wish the death penalty upon Akane. The detective confides in Kotarou that he believes humanity needs to find a way for her to atone without resorting to killing each other, and he suggests pinning the crime on a scapegoat. Later Ansai from the Monthly Terra magazine contacts Kotarou asking if he would like to publicly admit to his acts of heroism. The idea makes him feel terrible, but he quickly realises how he can use it to his advantage. He becomes an idol in the span of a few days, feeling terrible for having to betray everyone’s expectations, and then has the Terra magazine release information causing people to suspect himself as the mastermind behind salvation. When Akane confronts him about it, he tells Akane that the world needs a holy woman. She’ll atone by keeping humanity from growing too positive and reaching their potential, to keep them exploiting the environment and reaching for the stars in order to keep the world alive. Despite this new responsibility, the trial finds Kotarou and Akane guilty, and their punishment is exile. For the first time since we entered the shelter, colour has returned to the background again, and Akane is beaming with hope. The two are saying their final goodbyes before heading out into the wildness to spend the rest of their lives alone together. It feels a little bit like the book of genesis. They’re seen off by all of their friends and acquaintances, including Shimako who turned up for the first time since she parted with Kotarou. She bursts into tears and, for the first time we’ve heard her speak, tries desperately to convince everyone that she was the culprit. Akane notes that the transcription is progressing, and she is slowly becoming the next holy woman. Akane warns her of all the pain she will eventually inherit from Akane, and tells her to continue living no matter how hard it is. There’s a glimmer of hope for the future of the holy woman as Akane embraces her and she accepts her responsibility. Kotarou believes that even though they must be feeling love from the transcription, their feelings are surely real. “Love is a delusion. Every kind of love. Maybe the way I feel about Akane is no different. Even if it is, I don’t think I care.” They say their final farewells and depart for the barren plains, singing a song of hope. So that’s Akane’s route. It has a very nihilistic tone throughout the entirety of the route, before finally pulling through with some hope in the final moments. I will admit though, it wore me out reading it – it still does. This is a route which, even more than Kotori’s, drains all the hope and optimism out of the world. As the only route which chooses to fully place you on the side of the monsters, you really feel yourself becoming less and less human as you read on. But even so, Kotarou is strong, incredibly strong. Stronger than me, for sure. He sacrificed everything for Akane, and never stopped believing that she’d be saved. The ending was bitter-sweet. In any other context, being condemned to exile outside the walls of civilisation would be a terrible ending, but here it’s the opposite – it’s the first time we’re shown any hope in the entire route. And it’s a strong hope, you just know they’re gonna be okay. If they really did lose their humanity after all they did to destroy mankind, then it’s fitting that the sinners can only be happy far from paradise. I’m sure they both realise this, and take deep comfort in knowing that they can live their lives in peace from now on. And they weren’t executed either. Even though the world was destroyed, this ending gives a lot of hope for humanity surviving long into the future. Perhaps it’ll someday be up to Shimako to do the work of the holy woman and keep humanity in check. This is a route filled with great despair, but also great hope. It handled so many incredibly delicate topics elegantly and maturely, without getting overly dramatic. This route has so much to offer, even if it was overwhelming at times. Just keep struggling, because you’ll always find hope eventually if you keep searching for it. I apologise to my readers who were waiting patiently for this post – I’ve been working on it on and off over the past year, and only recently found the motivation to sit down and make the final push to get it out there. I’m really happy with the result though, so I hope you enjoyed reading it too. Now that we’ve finished reflecting upon the five heroine routes, it’s time for me to tackle Moon and Terra. I haven’t had the chance to replay them yet, so I’m really looking forward to seeing what I get from them the second time around. There’s gonna be a lot to talk about, so you can look forward to those posts sometime in the future. I can’t promise they’ll be really soon, but I’ll definitely get to them. Thanks for reading guys. I’ll meet you in the next world, wherever that may be. I think this route was nice, but I didn’t really buy into Kotarou’s actions here. There were definetly a lot of interesting themes that were handled very well, but something still felt a bit empty or lacking for me. I mean, Kotarou’s actions here felt like absolute opposites to what we were lead to think of him so far, and the whole story seemed to just drag him along the process as he did what the script commanded without very strong justifications or believeble resolve. To me, it was just unatural and the only part where I thought Kotarou actually creates a better resolve is towards the very end. Also, the fight scenes. Boy, they just felt so weak compared to Chihaya’s, Lucia’s and even Shizuru’s route. Romeo’s description in this route (something I believe was moderately better done in Moon) is just too much logical and “mechanical”, instead of more blood-pumping or energetical. The fight with the T-Rex familiar was not even close to how epic I believe it was intended to be, and it was over pretty fast. Takasago’s fight was a bit better, but I swear I just can’t understand why they wouldn’t sprite him, that would’ve done wonders as far as immersion is concerned. With that said, I do think that Akane was one of the most fleshed out heroines. Even though I don’t really like her compared to the other heroines, her problems and personality reveals were very interesting and gripping to read through. I wouldn’t say Kotarou’s actions were unnatural. Yes, his resolve was weak, but he was dedicated to his love for Akane. Like in the other routes, he initially desired only to be useful to someone, and that what his focus for most of the route, to be useful to Akane. To tie in with the whole theme of Rewriting, when he Rewrites his body in the jungle to combat the superhumans, you could say that it’s symbolic of him ‘rewriting’ himself to accomplish his goal of helping Akane. After they lost that battle, Kotarou continued to stand by her, a bit lost as of what to do. He just went along with whatever Gaia’s teachings told him just because his love for Akane was that strong. It’s not until Salvation that he realises that he had been lead astray by his love, and reacts by punishing Akane. He’s not without guilt though – he clearly realised the error of his ways and seeks atonement in the end. Kotarou was certainly not a very powerful character in this route, but he was incredibly strong, fighting to atone and live on with Akane for as long as he could. Most people would just give up, but he stood by her til the final moments, even taking the blame for her. I think that much is admirable. As for the fights feeling mechanical, maybe that’s just his writing style, but it felt pretty intentional to me. This route is in no way inclined toward the fantastical – it paints a very bleak picture of the world. It doesn’t want to glorify war and battle, but paint it as a bloody, cruel reality. If you want fantastical, blood-pumping fight scenes, you can check out Chihaya’s route. This isn’t what they wanted to accomplish with this route. Same deal with Terra, but I’ll go into that in a future post. I’m still reading through Terra, but I have to disagree with your point regarding the fighting scenes. Sure, Chihaya’s route is much more focused on that (most people hate her route, but I have to say it’s one of my favourites), but I don’t think that’s enough reason to “dumb down” this aspect in other routes. I agree this route was not focused at all in action sequences, so I get there’s not much of it and I am tottally fine with that, but I just think that when a fight does come about, it wouldn’t hurt for it to be much more entertaining. I can’t say for sure since I am not Romeo, but I do believe the fight with the T-Rex was supposed to be a big part of the climax, a very epic and frenetic fight to raise the stakes even more, albeit still being a bleak and very depressing scenario. And that’s when it comes his writing style, which I personally think it’s not very suited for action packed sequences, is all. As much as this wasn’t the focus, I don’t believe that serves as an excuse for the fights themselves being “saltless”. As I said, I think he did it better job in Moon, albeit still in a bit of a flawed way. The entire climax of the route is centered around a big all-out war between the occult club and Kashima’s familiars, the scenario itself being very epic, which I think Romeo better succeeded in conveying, but still with his very cold-logical and mechanical style throughout it. It could have been much more impactfull as an action scene, in my opinion. Just to be clear: I’m not saying Romeo is a bad writer, far from it (I still need to read Cross Channel), but I think his personal writing style is just not good when it comes to those more action-oriented sequences. He is very good portraying psychological characters, setting the overall bleak tone to then showing hope for the characters in the end, and can even build very strong emotional points (as shown in Kotori, Akane and Moon routes), but I believe he fails in the battle scenes regard. Ryukishi, for an example, is many times more a true writing master for me, since he can seemingly bland all those multiple elements in a cohesive and entertaining story should he choose to implement them all.